The long-term efficacy of any waterproofing treatment is reduced by mechanical strains during walking as well as by climatic effects. Therefore, depending on the frequency of wear and strain, leather should be retreated with a waterproofing product regularly. Upper materials and leather soles alike should be treated regularly. 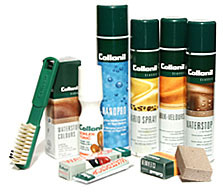 Because leather loses its fats and oils through regular use, causing it to become hard and brittle, it is advisable to use a COLLONIL care product regularly. We recommend the coloured care products for colour enhancement. Leather should be cleaned depending on its type and its soiling. Cleaning should always be carried out at regular intervals before waterproofing and care. Always try dry cleaning first because this is not so hard on the leather. Damp or wet cleaning is advisable for stubborn soiling. 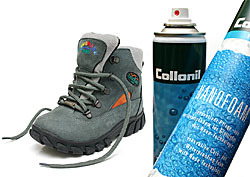 Afterwards renew the waterproofing and treat with a care product. Coated smooth leather has a thick coat of colour. The surface is relatively robust due to its dressing. Smooth leather is processed on the grainy side (outer side of the skin). It has a smooth, grained, structured, shiny or mat look. or LEATHERGEL - waterproofing gel for smooth leather. It is solvent-free. Check all materials for colour fastness prior to use. Fine smooth leather is also processed on the grainy side (outer side of skin). It has a smooth, fine, structured and usually very soft look. Nappa leather and specially fashionable finished leather are rather soft smooth leathers which are often quite hygroscopic and therefore require special care and conditioning products. Wet cleaning is not recommended for fine and smooth leathers. Do not apply cream without prior waterproofing treatment! Greased leather and oiled nubuck are specially finished leather, whose surface is provided with a high concentration of greases. RUSTICAL (liquid care with sponge applicator), special lotion for rustic greased and sport leather with conditioning waxes and oils, which keeps leather flexible and durable. It builds up the special greased character and revives the colour. or RUSTICAL (tube with sponge applicator), special conditioning for rustic smooth leather (greased and oiled nubuck), keeps leather resilient and flexible and prevents it from drying out and becoming brittle. Creatively designed fashion leather, for example with fashionable prints, plushed up fibres, foils, metallic pigments or material combinations. Care and cleaning depends on upper material, e.g. Nubuck and suede are abraded leather or rough leather. Nubuck: the grainy side (outer side of the leather skin) is abraded and has fine, velvety and short fibres then. Suede: is the meat side of the animal skin (inner side of the leather skin) with a typical fibre structure. NUBUKBOX for gentle dry cleaning, it roughens fibres thoroughly. CLEAN & CARE conditioning cleaning foam highly effective and gentle cleaning, solvent-free and without propellants. NUBUK & TEXTILE (liquid care with sponge applicator) - liquid suede care with waterproofing additives, it has a colour activating effect and preserves the velvet fibres. Patent leather or materials with a patent finish are smooth, embossed, wrinkled and frequently finished with various leather optics under the patent layer. Special conditioning additives are required for preserving elasticity. These are different textile fabrics and knitted fabrics such as silk, satin, rep and cotton – also refined or elastic. The Tex membranes are meanwhile processed with practically all upper materials and are located between the upper and lining layers. They are impervious to wind and water as well as breathable. Well-known Tex materials are Gore-Tex and Sympatex. The upper material is exposed to all climatic effects without any protection. In order to protect the upper materials effectively and to preserve the function of the membranes permanently, these materials require special care.